Biomimicry and Science: Applying Nature’s Strategies introduces students to eco-literacy and design innovation concepts through project-based learning methodologies and by emphasizing real-world applications. At a time when we need sustainable solutions to solve many pressing local and global challenges, researchers are finding that solutions to many of these problems already exist in nature. Biomimicry is the practice of looking to nature for strategies to solve human challenges. This course reinforces core content in chemistry, physics, and biology, using striking examples from nature and bio-inspired design as a framework to capture student interest. Introduction to Biomimicry, a lesson that can be used from the launching point of any classroom to orient students to the exciting practice of biomimicry. 15 unique and engaging biomimicry lessons—five for each of three core areas: chemistry, physics, and biology. 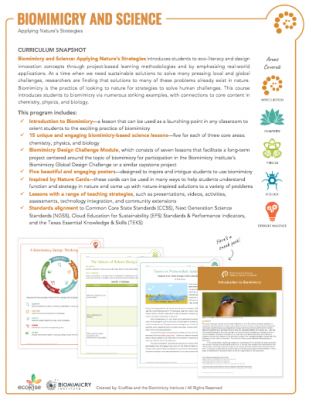 A capstone biomimicry design challenge provides students an opportunity to participate in an international design challenge through The Biomimicry Institute (click the “Downloads” tab below). To purchase the Biomimicry and Science, visit https://ecorise.org/shop/ today! 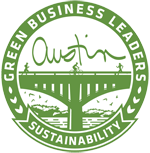 To learn more about the Biomimicry Design Challenge, click here. "I love EcoRise's online platform and that the lessons are available in Spanish. I teach at a Title I school that has majority Spanish speakers. Having the Spanish lessons for my students will make science that much more accessible and approachable.